This textile and fabric weight converter helps you easily convert the weight of fabric between GSM (Grams per Square Meter) and OYS (Ounces per Yard Squared). - Grams per Square Meter (g/m2) to Ounces per Square Yard (oz/yd2). 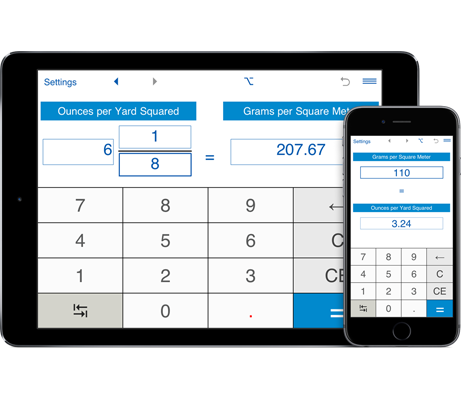 - Ounces per Square Yard (oz/yd2) to Grams per Square Meter (g/m2). You can input both decimal and fractional values. To switch to the "fractional" mode, click the button in the top menu. You easily convert fabric weight from grams per square meter and ounces per yard squared (GSM to OSY) and ounces per yard squared to grams per square meter (OSY to GSM). Textile fabric weight converter stores conversion history and lets you send results and conversion history via email.